Let’s begin with the recent announcement shared on Search Engine Land that Google is emailing out to “select accounts” an opportunity to have their accounts be included in a pilot program that that would allow Google to make changes to everything but your budgets – including account structures, keywords, bids and ad copy. This isn’t the first time Google has been so gracious in offering to change all of your Google Ads without your consent – we wrote about the exact same thing about a year ago here. It is however, the first time they clearly seem to be trying to circumvent an agency that might be managing a clients account. Google vs Agency Conspiracy Theory? While it’s fairly well known in the industry that within days (sometimes hours) of meeting with your new Google strategist about your new account, that they have turned around and contacted the agency client directly. We’re sure Google has the client/agency relationship in their best interest, but… Scratch that – we’re not sure, and we’re also not sure that this recent update is in anyone’s best interest either. If you are selected to be part of this pilot program, you are notified via email that you’ve been automatically opt’ed in. While we won’t dwell on the obvious concerns marketers who care about their brand guidelines have expressed, let’s focus on the fact that in an agency relationship, we manage our clients accounts through what’s known as an MCC. Formerly the My Client Center, and now the Google Ads Manager Accounts – these MCC’s allow us to manage a clients account without owning the data. 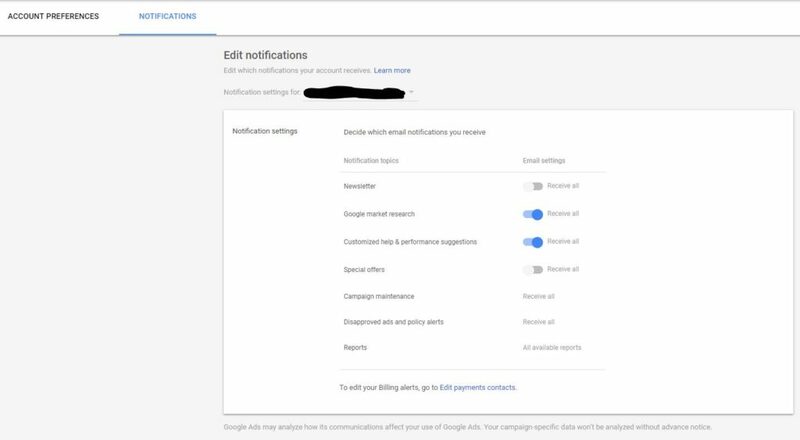 Notifications in Google about account changes are directed to the client email, not the agency email according to the notification center. However, if you notice in the image above, notifications about campaign maintenance and policy alerts are all emailed to the clients email address – not the MCC agency address. While there is no way for an agency to go into the account settings (as shown below) and select “don’t automatically change my campaigns” like there was with ad suggestions tool – it stands to reason that the only way an agency can find out is if a client forwards the email to the agency within the allotted 7 day window. We have transitioned a number of Google Search accounts from other agencies to Media Two, and we understand when clients come to us it’s because they aren’t getting the full optimization efforts that they feel they should. So my best guess is that Google is seeing this as well, and this is a great opportunity for them to get clients to increase spend, or at the very least spend it more quickly or efficiently. Let’s face it, Google has a great product, and they probably feel like some agencies are squandering it. While I understand Google trying to do everything in their power to generate revenue for themselves, it is still an agencies job to protect it’s clients and form partnerships with their vendors, that then in turn generate revenue for our clients. Upon finding the actual emails, you can then click an opt out link that is embedded in the emails – or you can forward it to your agency to review. But remember, you only have 7 days or you’ll be automatically opt’ed in. They did say that you can opt out at any time after that, however, instructions are still forthcoming. 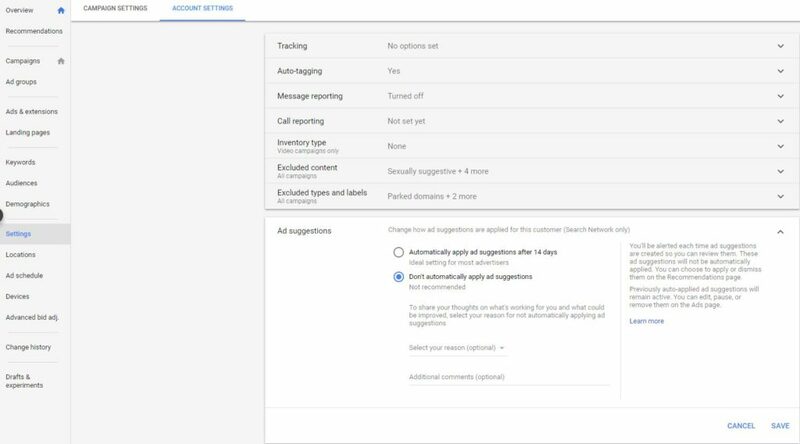 We continue to hope that any future “enhancements” like this that require clients potentially searching for email subject lines will also come with an opt-out function in the Google dashboards similar to the ad changes one. Or maybe they’ll even surprise us, and make it an opt-in process… But now I’m just asking for way too much. Full Disclosure. I love the Google Search program. We have been a Google partner for years, and we continue to help our clients maximize the return through ongoing testing and optimization. Based on these changes over the last year, we just very well might be in the minority and that’s what’s forcing Google’s hand.